Misalignment and guesswork will eventually destroy your expensive equipement. 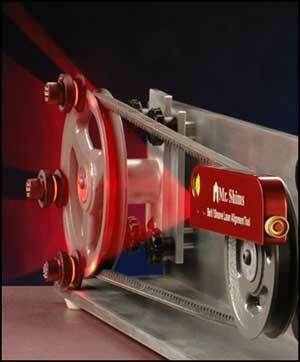 Mr. Shims' laser alignment tool solves these types of problems. Premature failure and accelerated belt and sheave wear are a thing of the past. 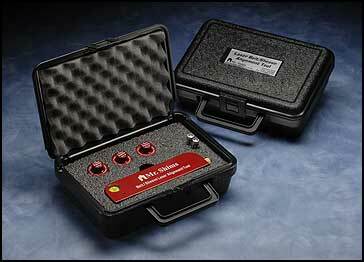 Step into the future with this American Made Red Laser Alignment Tool. It's economical, portable, with no training required. The LASER and magnetic targets and magnetic targets set up in minutes, showing you exactly what to do. 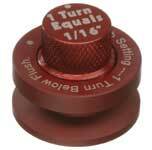 Comes with adjustable targets for sheaves of different thicknesses. Alignment with a string or straight edge normally takes two mechanics. 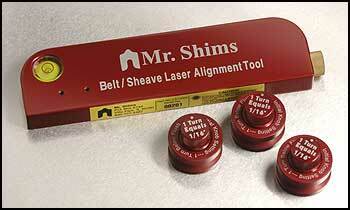 With Mr. Shims' Laser Alignment Tool, one operator can align sheaves quickly and easily. All adjustments are "live" and easy to accomplish accurately. Pulley Alignment Tool: W x L x D: 1-3/4" x 6-1/2" x 5/8"
Case Dimensions: W x L x D: 7" x 10-1/2" x 3"
Used for laser alignment method and basic method. This versatile stand is capable of enabling parallel, axial and angular adjustments. Adjustable friction of sheave rotation and adjustable belt tension. Approximate size and weight, 23.0" L x 4.5" W x 9.0" H, 17 lbs.